Home > Row by Row Experience > Pattern: Tag Team - use with Row by Row License Plates! Use with fabric license plates you collect during Row by Row Experience! Here in Maine we call license plates "tags". So we created this quilt design, "Tag Team", for use with fabric license plates you collect during Row by Row Experience. 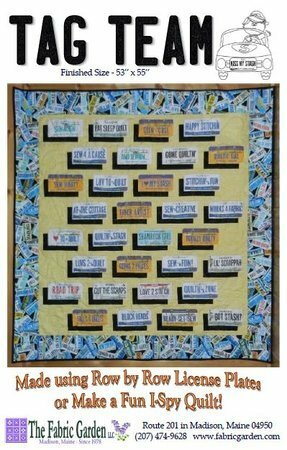 And if you don't have fabric license plates, you can fill that area in with fabric of your choice to make an "I Spy" quilt! Dimensions of finished quilt: 53" x 55"